cancellation is possible until one month before arrival, if group cancel after this time or no show we will take a payment of 50%. We will ask a deposit of 100 euro for the keys and damage. 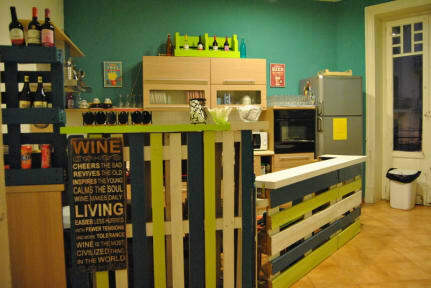 Dear travelers welcome in Palermo, welcome in “On the Way Hostel”! Situated on the first and second floor of a19th-century building in the dynamic historical center of Palermo, our hostel offer private and dormitory rooms equipped with simple furniture, ceilings fan, balconies and safe boxes. bed linen are inclused, towels and laundry service for payment. the sightseeing spots, the popular night life squares and the famous street food locations are just around the corner. O hostel é agradável, serve café da manhã e é um bom lugar para estar de passagem. A localização é ótima, próxima a mercado e poucos minutos da Estação Central. Os chuveiros e banheiros poderiam ser mais limpos, as camas do quarto onde fiquei poderiam estar em melhores condições também. Ótimo custo benefício, limpinho e bem localizado. Único problema é o barulho pois fica de frente a uma avenida super movimentada. No mais, atendeu!! !